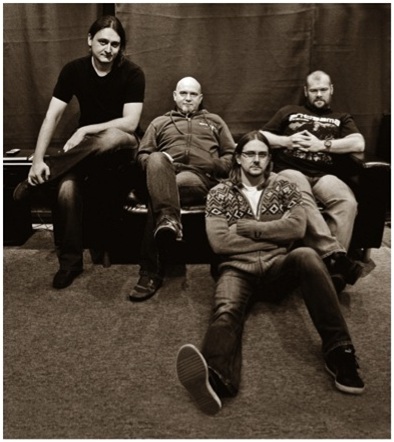 November 16, 2012 (Los Angeles, CA) — Poland’s progressive rockers RIVERSIDE have just completed their fifth studio album, SHRINE OF NEW GENERATION SLAVES, and are proud to announce the effort will see a North American release on February 5, 2013. Out on longtime record label InsideOut Music, the album will also be available in Europe on January 21, 2013. Fans can read about the album’s recording process on the band’s blog here, and a video interview that was done with RIVERSIDE directly from the studio can be seen here. SHRINE OF NEW GENERATION SLAVES is the follow up to the band’s 2009 release, Anno Domini High Definition, which entered the Poland charts at #1 and has since hit gold album status. In 2011, RIVERSIDE also released an EP titled Memories In My Head to celebrate the band’s 10th anniversary.